Ebony Logins was elected to the District of Sooke Council in 2014 and again in 2018. Ebony was raised in a renovated school bus in the Sooke hills and is a graduate of Edward Milne Community School. She lived in Nanaimo, Vancouver, Vernon, and Kelowna before returning to Sooke. She is happy to now live, work, and play in her hometown with her family, including her charismatic dogs – Monty, a border collie cross and Cooper, a labernese. In 2009, she obtained a degree in Tourism and Recreation Management from Vancouver Island University. A highlight of her education was researching sustainable tourism development in Belize and presenting the findings at the World Leisure Congress in Quebec City. Dedicated to making Sooke an engaging and vibrant place for all, Ebony works in Sooke as an executive director in the non-profit sector. She has coordinated several youth empowerment projects and conducted research on societal issues for people under 30 in the Sooke region. As a life-long volunteer, Ebony has dedicated many years to sporting events and coaching. 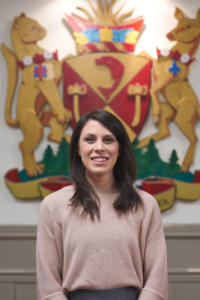 She is currently head coach of the Jr Girls Basketball team at Edward Milne.